Go to any typical Gujarati family for breakfast on weekends and masala puri or tikhi puri with sugary masala tea will surely be served to you. The younger Gujaratis usually do not make them that often as they prefer to shy away from fried stuff, but they do relish them when someone else has made them. My Dad’s favourite…. anytime can be tikhi puri time. If bhabhi makes dosas for the rest of the family, my dad is happy with tikhi puri and a mug of tea. There are 2 versions of the tikhi puri you can make, the soft type or the slightly crunchy type. The soft type is good to have on the same day whereas the crunchy type can be stored for 3 days or so. My father in law loves the crunchy type. Excellent travel food or tiffin food as its called. The recipe below is for the crunchy type. 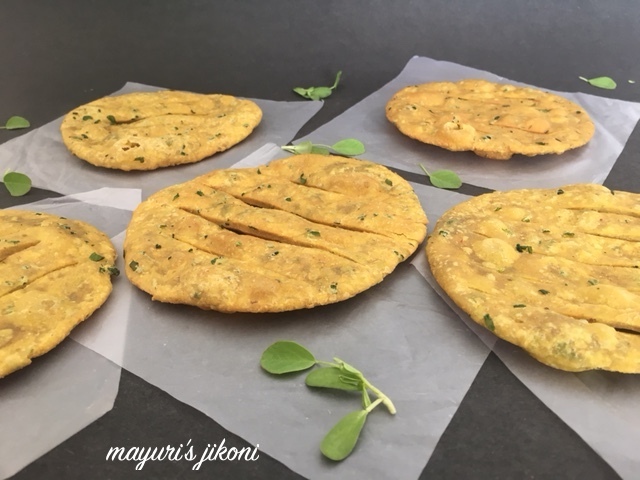 For the regular softer type of puri just add 3 tbsps of oil and avoid the fresh coriander or methi as it will prevent it from puffing up when you fry it. I love tikhi puris with sweet mango pickle (chundo) and masala tea. Its comfort food for me. As a child, sometimes we would got for a long drive upto Limuru where it would a bit cold and misty with my uncle. Then we would stop at a ridge where below you can see the valley. Out would come out a thermos flask with hot masala tea and some puris. Who says picnics have to be loads of food… these two are more than enough. Sieve the flour. Add to it all the spices, salt and coriander or methi and mix well. Add the oil and rub it into the flour. With the help of the water form a stiff dough. Can add more water if required as the amount required depends on the type of flour. Cover the dough and let it rest for 15 -30 minutes. Divide the dough into 20 or 25 portions and roll between your palms to form a ball. Roll out the puris. Cut 4 slits as shown in the picture. Heat the oil for frying over medium flame. When it is hot, fry the puris one by one over low heat. Do not fry over high heat as they will not come out crunchy. Serve them hot or store in an airtight container once it is cool. Don’t roll them out too thick as they will not turn out crunchy. If you do not have ajmo or ajwain, use cumin seeds. Can add salt and chilli according to your taste. If you are making the softer type, roll out the puris small. Use half the recipe. Fry them over medium flame. For masala tea, add fresh ginger to the boiling water. Typical Gujju ! The Poori 's look so good , I would love to munch on them with some Gujju choondo or Gorkeri . Poori looks great and love all the flavors went it. Great share. Pass me these masala puris, please. Love them totally. they look so pretty – crispy and golden! This sounds so flavorful. The idea of eating these pooris while drinking a hot cup of tea is so appealing. these loos fab mayuri! why to shy away from such a yumm snack, i m bookmarking this to try on a weekend!